Currently there are no drugs to combat Ebola, and the death toll from recent outbreaks in West Africa is approaching 1,000, according to the World Health Organization. Immunizations might one day lessen the virus’ impact, but vaccines have limitations that other drugs do not. Ebola is a severe, often fatal illness in humans. Outbreaks have occurred primarily in remote villages in Central and West Africa near tropical rainforests. It is transmitted to people from wild animals and spreads in the human population through human-to-human transmission. Schneller has studied Ebola for the past decade. 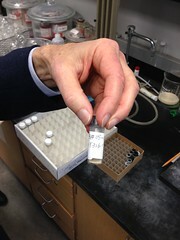 The drug design research taking place in his laboratory has focused on combatting a variety of virus-caused infections, including Smallpox, Yellow Fever, Hepatitis C and others. More extensive studies with Schneller’s new discovery are already underway through a partnership with the National Institutes of Health.